A fervent opponent of a two-state solution to the Israeli-Palestinian conflict and backer of policies pursued by Israel’s rightist Likud Party, Evans has made common cause with right-wing groups like John Hagee’s Christians United for Israel (CUFI), which views the return of Jews to the Holy Land as prerequisite for triggering a succession of prophetic events that will lead to the second coming of Christ. In the past, JPT’s board of governors included Pat Robertson, Joel Osteen, Jack Graham, Anne Graham Lotz, Tim LaHaye, John Maxwell, Jack Hayford, and Pat Boone. As of 2016, JPT does not list a board of governors on its website. Evans claims both Likud Party leader Benjamin Netanyahu and former Israeli prime minister Ehud Olmert as “close personal friend[s]”. Evans is the author of more than 30 books, including Showdown with Nuclear Iran: Radical Islam’s Messianic Mission to Destroy Israel and Cripple the United States (2006), The American Prophecies: Ancient Scriptures Reveal Our Nation’s Future (2004), Beyond Iraq: The Next Move (2003), and Jerusalem Betrayed: Ancient Prophecy and Modern Conspiracy Collide in the Holy City (1997). Evans also stringently opposed the nuclear negotiations between Iran and six world powers that successfully ended in a historic deal in July 2015. He wrote in 2013: “Much as did Herod, he [Barack Obama] also has his own agenda—to find a way to push the Iranian crisis into the hands of the next president. Mr. Obama would then be able to go down in history as an anti-war president no matter the cost.” He went on to claim that a “former director of Israel’s atomic agency” told him that if Iran “goes nuclear,” there will be “worldwide Armageddon” within ten years. Evans’s articles have appeared in a number of major newspapers, and he is frequently invited to comment on foreign policy issues by mainstream and rightist radio and television programs. According to his biography, Evans “has appeared on hundreds of network television and radio shows including Good Morning America, Cross Fire, Nightline, The Good Morning Show (Great Britain), and appears frequently on the Fox Network, CNN World News, NBC, ABC, and CBS. Mike Evans has won more than fifteen national awards for his prime time specials based on his books.” Evans has also appeared on Paul Vallely’s “Stand Up America,” a staunchly right-wing radio program (also available on the internet) that regularly features neoconservatives and hardline policy wonks as guests, including Michael Ledeen , Frank Gaffney of the Center for Security Policy , Brigitte Gabriel , Rachel Ehrenfeld , Caroline Glick, Mark Steyn, Kenneth Timmerman , Ann Coulter, Brad Blakeman of Freedom’s Watch , and Cliff May of the Foundation for Defense of Democracies . For more on Christian Zionism, see Chip Berlet and Nikhil Azizi, “Culture, Religion, Apocalypse, and Middle East Foreign Policy,” Right Web, December 5, 2003. Michael D. Evans, Jerusalem Betrayed: Ancient Prophecy and Modern Conspiracy Collide in the Holy City, (Dallas: Word Publishing, 1997); Michael D. Evans, Beyond Iraq: The Next Move (Ancient Prophecy and Modern Conspiracy Collide), (Lakeland: White Stone Books, 2003); Michael D. Evans, The American Prophecies: Ancient Scriptures Reveal Our Nation’s Future, (New York: Warner Faith, 2004). “About the Book,” The Final Move Beyond Iraq, http://www.abebooks.com/Final-Move-Beyond-Iraq-Solution-World/16909104889/bd. Evans, Beyond Iraq, p. 83. For Evans speaking engagements at CUFI events, see Christians United for Israel, “Nights to Honor Israel Reports,”http://www.cufi.org/site/PageServer?pagename=events_honor_israel. Jerusalem Prayer Team, “Why Pray for the Peace of Jerusalem,” http://www.jerusalemprayerteam.org/why-pray-for-the-peace-of-jerusalem/. Save Jerusalem, “Dr. 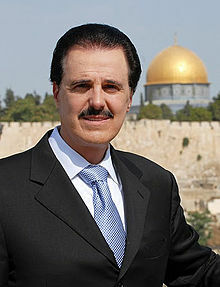 Michael D. Evans,” http://www.savejerusalem.org/about/dr-mike-evans. Bill Berkowtiz, “A General in God’s Patriotic Army,” Asia Times, June 15, 2007,http://www.ipsnews.net/2007/06/politics-us-a-new-general-for-gods-army/; Jerusalem Prayer Team, “About Jerusalem Prayer Team,” http://www.jerusalemprayerteam.org/about/. Bill Berkowtiz, “A General in God’s Patriotic Army,” Asia Times, June 15, 2007,http://www.ipsnews.net/2007/06/politics-us-a-new-general-for-gods-army/. Bill Berkowitz, “The Most Influential (and Self-Promotional) Christian Zionist You’ve Never Heard Of,” Alternet, February 23, 2009, http://www.alternet.org/story/128353/the_most_influential_(and_self-promotional)_christian_zionist_you’ve_never_heard_of. Rev. Robert O. Smith, “A Lutheran Response to Christian Zionism,” paper delivered to the ELCA Conference of Bishops gathering in San Mateo, Calif., in March 2008, http://onlinelibrary.wiley.com/doi/10.1111/j.1540-6385.2009.00471.x/abstract. Paul Weingarten, “Righteous Gentiles Honored by Exhibit,” Hobart Mercury, Australian Associated Press, January 1, 1988. Internal Revenue Service, 2006 Form 900 for Corrie ten Boom Fellowship, Inc.,https://web.archive.org/web/20080720204306/http://dynamodata.fdncenter.org/990s/990search/esearch.php. “Unruly Cambodian Crowd End Crusade Early,” Christianity Today, January 9, 1995,http://www.christianitytoday.com/ct/1995/january9/5t157b.html?start=1. Robert O. Smith, “A Lutheran Response to Christian Zionism,” paper delivered to the ELCA Conference of Bishops gathering in San Mateo, Calif., March 2008,https://web.archive.org/web/20090603230120/https://archive.elca.org/peacenotwalls/downloadable/Smith%20(2008)%20-%20Toward%20a%20Lutheran%20Response%20to%20Christian%20Zionism.pdf. Michael D. Evans, “BETRAYED: The Conspiracy to Divide Jerusalem,” Jerusalem World News, November 30, 2007,http://www.oyuninternet.com/book_a_speech.php. Michael Evans, “John Kerry Would Cut Israel in Half,” The Blaze, February 10, 2014,http://www.theblaze.com/contributions/john-kerry-would-cut-israel-in-half/. Michael Evans, “Un-Wise Men of Persia: The Gifts that Obama Brought to the Iranian People,” The Blaze, December 20, 2013, http://www.theblaze.com/contributions/un-wise-men-of-persia-the-gifts-that-obama-brought-to-the-iranian-people/. See Jerusalem Prayer Team, the Evans Institute for Middle East Studies, and Save Jerusalem. Corrie ten Boom Fellowship 990 tax return,https://web.archive.org/web/20080720204306/http://dynamodata.fdncenter.org/990s/990search/esearch.php. The Final Move Beyond Iraq web site, “Who Is Dr. Mike Evans?”https://web.archive.org/web/20090622180341/http://www.thefinalmovebeyondiraq.com/bio.html. Stand Up Americawith Paul Vallely, http://www.standupamericaus.org/. The Nowhere Debate; Profiles on Blackwater, Julie Finley, Michael Evans; And More.